Grass is at its most verdant this time of year in deep contrast to the surrounding perennial borders. 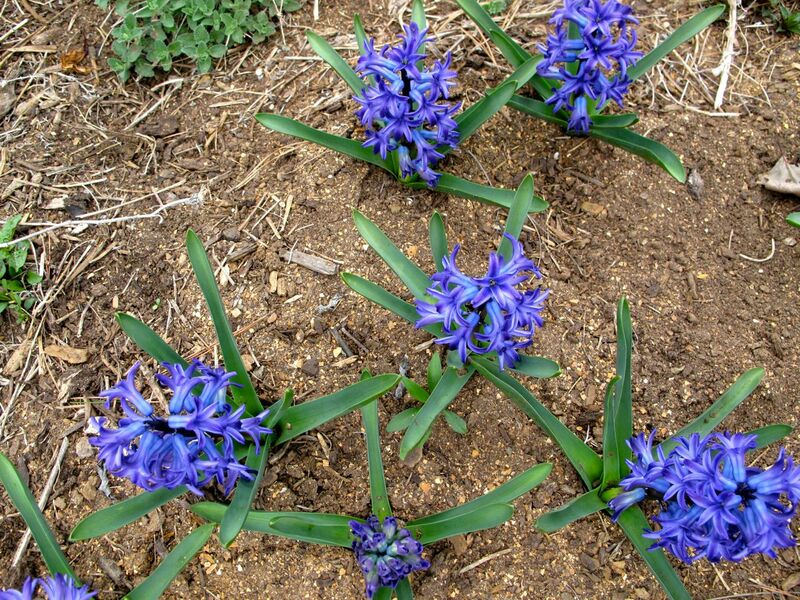 But with iris, monarda, columbine and phlox reaching upwards and filling out, soon the focus will shift. In the meantime a crescent of viola in the meditation circle are fairly ostentatious and a few hyacinths add color to the northern border. Last week I purchased more Iberis, one of one of my favorite ground covers. It needs to be planted right away, but rain is pouring down this morning. This is Iberis sempervirens ‘Snow Cone’. This time of year I hear the garden center call. While many gardeners are dealing with seeds and seedlings, I am just itching to add some things to the garden that offer immediate gratification. For several weeks though I have been single-mindedly working on garden cleanup and finally yesterday I completed the weeding—I made it around the entire garden and those pesky things will not dare return. Now I can concentrate on some planting fun. From this upstairs view of the garden one can see much more white fence than evergreen shrub. Succumbing to drought and other excuses, over the years countless shrubs have died out and been replaced, only to have them die out also. The five Juniperus chinensis ‘Blue Point’ (Blue Point Juniper) have been the exception. Garden view from above, with Juniperus chinensis ‘Blue Point’ (Blue Point Juniper) hedge along southern border. 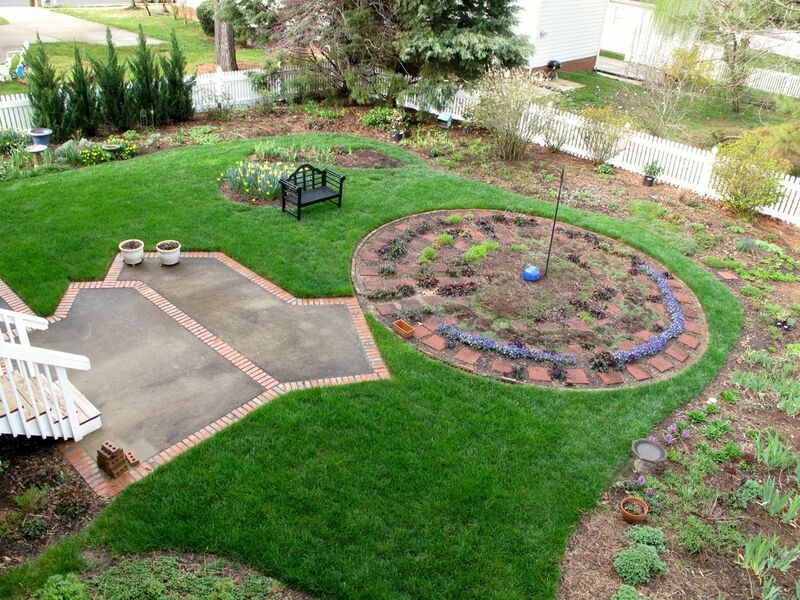 I had intended to make a plan to add shrubs to the garden over the fall and winter. The Chuck Hayes gardenia hedge along the back fence has dwindled to a mere five bushes and this harsh winter has contributed further to its demise. Two days ago I dug one gardenia out completely and pruned another way back nearly to ground level to try to revive it. Only one other looks healthy and it is hidden out of view behind the spirea. Yesterday, without a plan but under the magical spell of springtime, I explored a local garden center to look for new shrubs. The nursery aisles were bursting, with more temptations being unloaded all the time. Although what I came home with are not perfectly well-suited to the garden, they spoke to me. Shade loving plants for a garden that has little shade? Surely I can convince them to thrive. 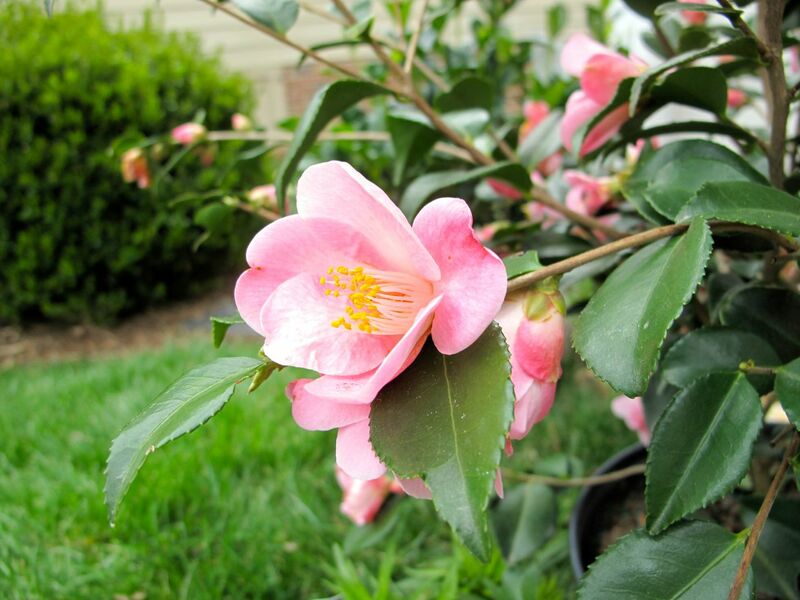 Soon I had selected a pink single camellia with a delightful and strong, sweet fragrance. Its name is Camellia X ‘Koto-no-kaori’. It features an upright form, reaching 8-10 feet at maturity. I will wait a few days to plant it as the temperature is supposed to dip into the twenties this weekend. Koto-no-kaori needs light shade, which will be a bit of a problem. We plan to lop off some lower branches of the juniper in the southwest corner, so I may be able to work the camellia under its protection somehow. I use to see Acuba growing on UNC’s campus and found those yellow dotted leaves fascinating. Now, realizing how useful its foliage can be in flower arranging, I have been focused on acquiring one. 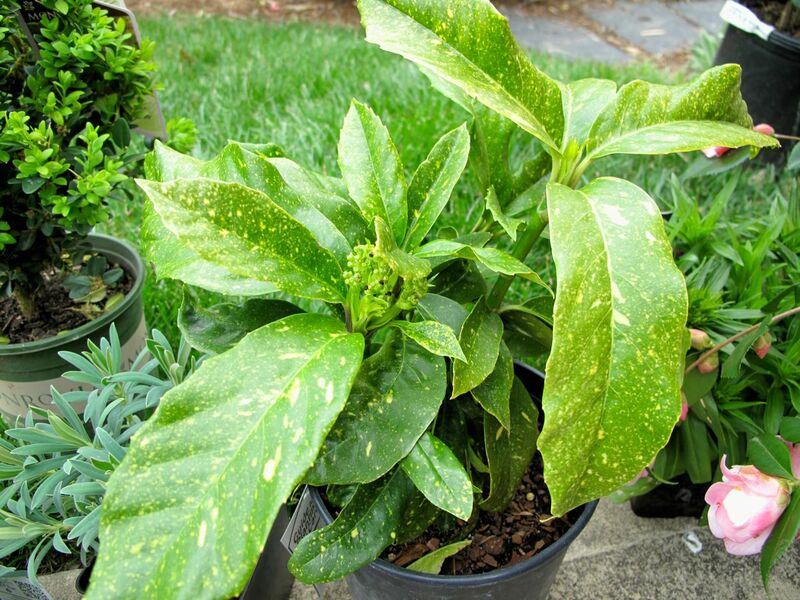 Welcome Aucuba japonica ‘Variegata’ (Gold Dust Aucuba), but where will I put you? Your mature size is 6-10’ H x 4-6’ W and your foliage burns in sun. 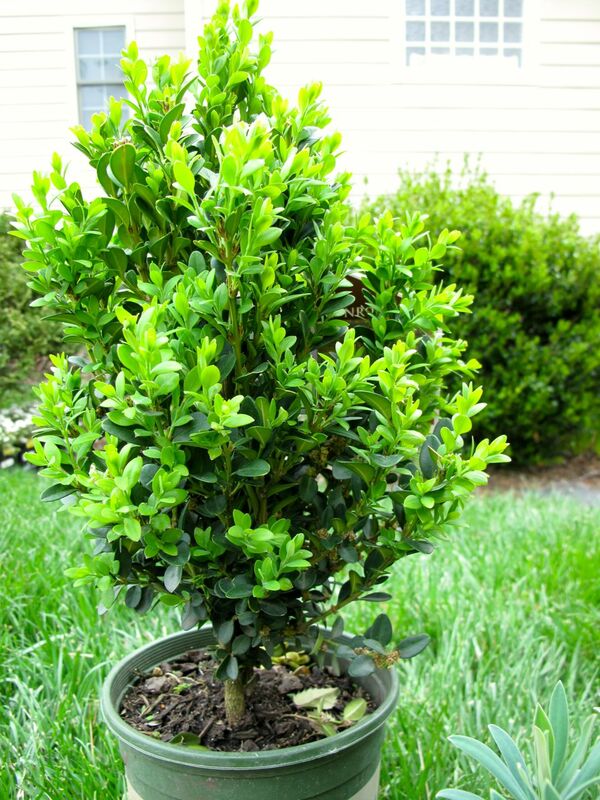 One shrub that can take full sun is Buxus x ‘Green Mountain’ (Green Mountain Boxwood). This upright, cone-shaped evergreen is a moderate grower, maturing at 5′ H x 3′ W. It has bright green foliage. Looking around the nursery I became distracted from shrubs at some point with predictable results. 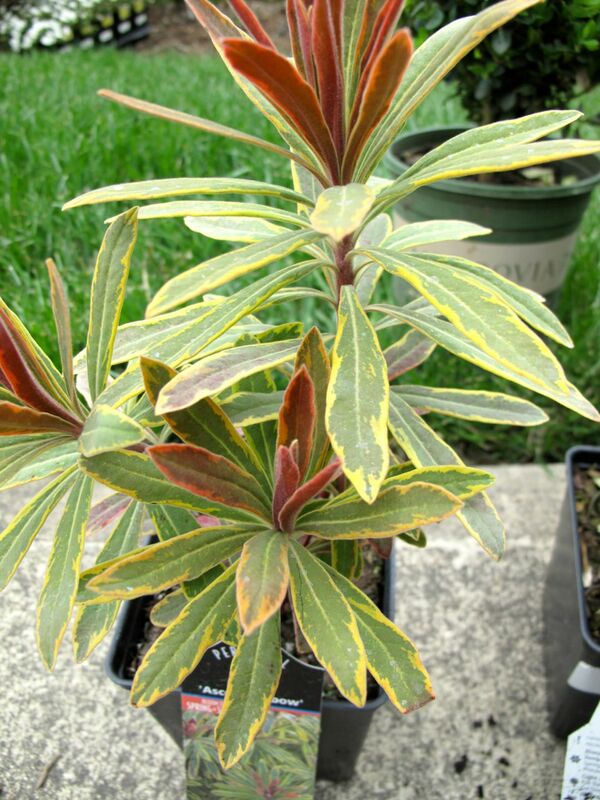 These two sun-tolerant perennials are Euphorbia ‘Ascot Rainbow’ and Euphorbia ‘Shorty’. 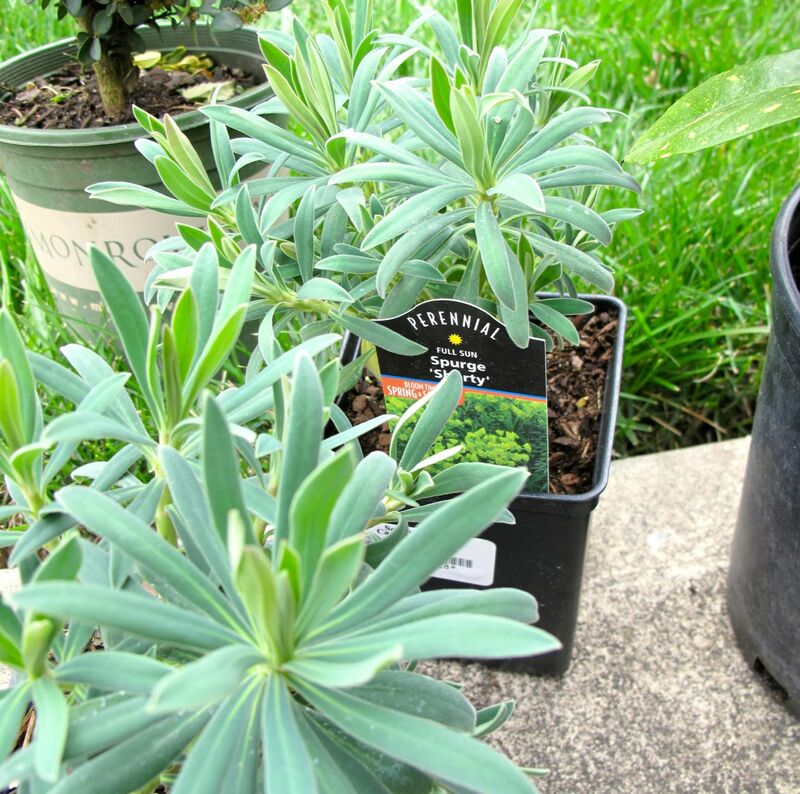 I have grown Euphorbia ‘Blackbird’ in a pot for a number of years, but finally decided to try some others. These should form nice mounds. 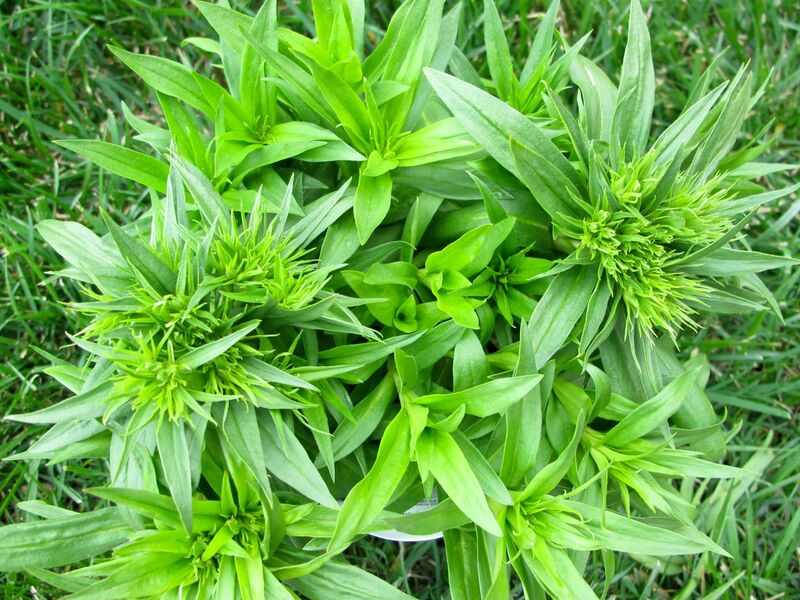 Last fall’s Sweet William seeds are still in their packet, so I bought a healthy-looking clump of Dianthus barbatus ‘Barbarini Mix’. This old-fashioned plant is one I always want in the garden. Oh, I did find a new gardenia that claims improved cold hardiness (zones 6-10). Gardenia jasminoides ‘Summer Snow’ features fragrant, double white flowers and grows 4-5′ tall. I may even go back for a couple more of these. I hear the garden center calling. 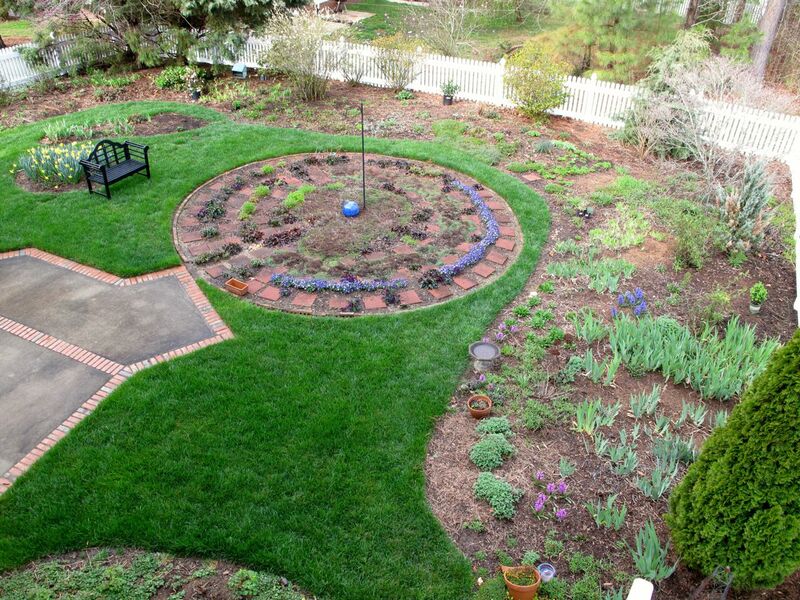 This entry was posted in garden and tagged evergreen shrub, meditation circle, meditation garden, meditation path, spring garden on March 27, 2015 by pbmgarden. What fun to have space so that you can add those shrubs. And what fun to deliberate on your choices. 31 Flavors come to mind. Enjoy. Thanks John. It is fun to get a chance to dig, or will be when the weather clears a bit. What could be nicer than a trip to the garden centre with space to put some plants! I hope your Gardenias are a cold hardy as you hope; when I read about yours surviving winter cold it inspires me to search for some for my garden or a least for posts on the terrace. Enjoy your planting; successfully weeding the whole garden demands some pleasure! I too hope that the gardenia is hardy. Hope you can find some for yourself. They have such a wonderful scent. Judy, you must be so ready for some relief from that snow. I’m not a big fan of grass usually, but for 3-4 weeks each spring I can’t help but admire this grass. It turns brown with summer heat though, especially without plenty of rain. Thanks Cathy! It’s hard not to indulge when it comes to the garden this time of year. I think I may try to connect those two beds behind the bench. One evolved from a space where we couldn’t keep grass growing and another is where a tree was removed. I should give them more thought. They look as though they are meant to be that way… little islands. 🙂 I had a mini island in the lawn of my last garden, a similar shape to your larger one, and made a miniature “Japanese” garden with a small bamboo, a dwarf acer, an azalea, my buddha statue and a few other small plants. I was sorry to leave it! Cathy, I can just imagine how delightful your Japanese garden would have been. You’ve given me ideas! Your garden is looking so lovely. It’s amazing how a weeding session can remove almost all traces of the preceding harsh season. 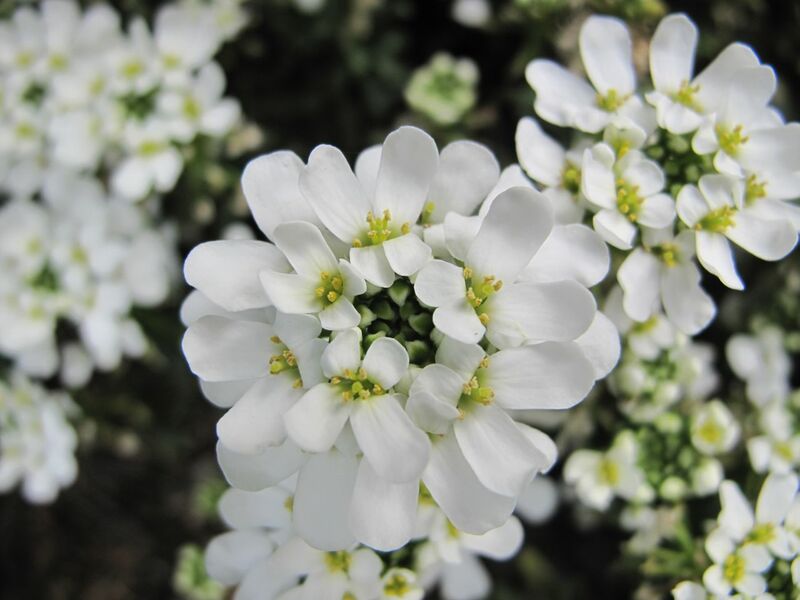 I love Iberis sempervirens – I put a couple of plugs in this last summer, so I am looking forward to a spring display in 6 months 🙂 Your other plant choices are all exquisite…I had wondered about the fate of your gardenias. They are a shrub that is supposed to be too tender to grow in my climate (I used to have them in Sydney) but seeing this new hardy cultivar gives me hope. I suspect my summers are too cool for them to flower, but now I am definitely on a mission! Thank you Matt. I was so happy to get outside this spring even weeding didn’t seem too bad this year (at least for the few few days). I hope this gardenia performs well and hope you can find one for your garden too. Well done Susie for finishing your weeding! I don’t think I would ever get to the garden centre if that was my criteria. Garden centres at this time of year are so tempting aren’t they – I love the camellia and your gardenia. 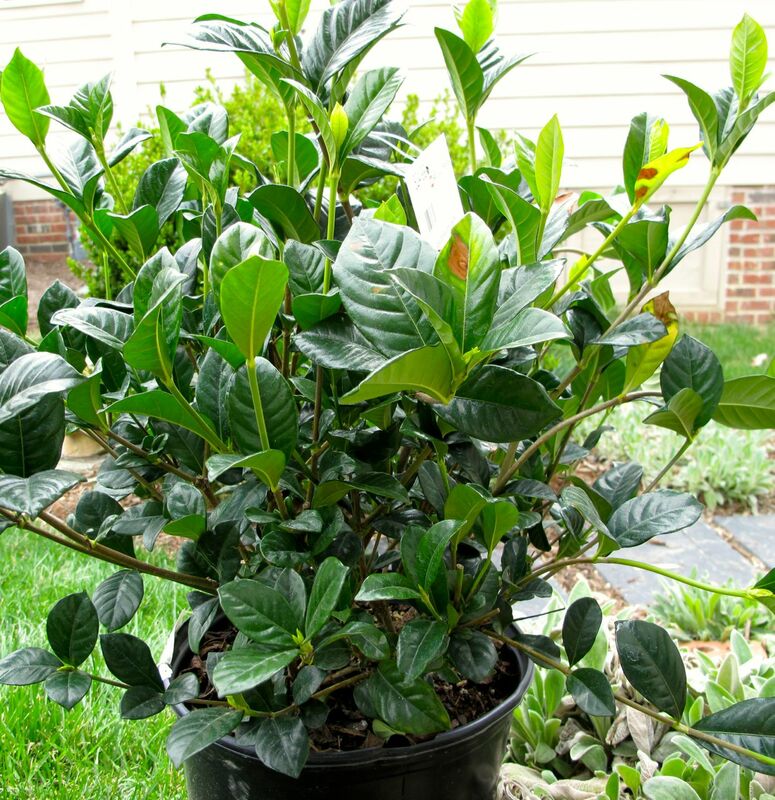 I have never seen a garden gardenia for sale before – I hope they make it to the UK soon! Last spring I didn’t get everything weeded before the garden filled in and it was impossible after that to get a handle on it. Already, the weeds are on round two. It surprises me you wouldn’t see gardenias for sale. Until I started blogging I took them for granted because many yards use them here for ordinary landscaping. Even though they’re ubiquitous, gardenias are a little borderline for my plant hardiness zone 7b, where our average extreme minimum temperature is 5 to 10 F (-15 to -12.2 C). Would they be cold hardy where you live? Well done on finishing your weeding, I am still battling on with mine. I love it in Spring when for a short time you have the garden looking weed free and you kid yourself that this year you will keep on top of it all. And then May comes and whoosh off it all goes. Lovely to go shopping to fill the gaps, I bet you had fun. A hardy Gardenia sounds good, I can never keep them going very long in the house. Thanks Liz, as you can imagine, after just a day the weeds have regrouped and are ready for round two. Last year I never made it this far with the weeding. Someone gave me a gardenia houseplant once and I couldn’t make it happy at all. What a great post, it really sums up so many of the good things about early spring! I’m glad to hear you have your gardening spirit back in full force this spring, was it last spring that the mojo just wasn’t there? I was worried you were moving on to other new and exciting things and putting the garden on the back burner so it’s good to hear the excitement in your post. The new purchases will be fun. I envy your camellias and gardenias, and I’m glad to see you planting the acuba. It seems like a perfect fit for your gardening taste and should be completely useful for stealing a leaf here and there for your arrangements. I think it will still be another few weeks before my favorite nursery opens for the year, but seeing all your goodies just lit my fire! Glad I could help spark the excitement for visiting the garden nursery, although I’m sure you were ready anyway. You have a good memory–yes, last year I burned out early on the garden. It felt more like an obligation than a joy. This year I’m savoring it. You’ll be getting into the soil soon. I like your new purchases and think that they will look super in your garden. Well done on getting all your weeding done already, you are much further on than I am! Thanks Pauline. You know the old saying “like a kid in a candy shop”? That was me at the nursery the other day. I tried to stay focused on shrubs but did make some mental notes for later. The weeds are already laughing at me. Doesn’t take them long to try again. The view of your garden looks really lovely. I like your plant choices too, I know what you mean when you said they were plants that spoke to you, instinctive choices are often the best and your grass is so green it looks like a brand new lawn. Happy spring gardening Susie! I appreciate your comment Julie and your use of the phrase “instinctive choices.” That sums up my gardening style totally! Not that my instincts are always good but I enjoy gardening without just following the rules. Have added your Camilla to my Pinterest Plant Shopping List! Beautiful. 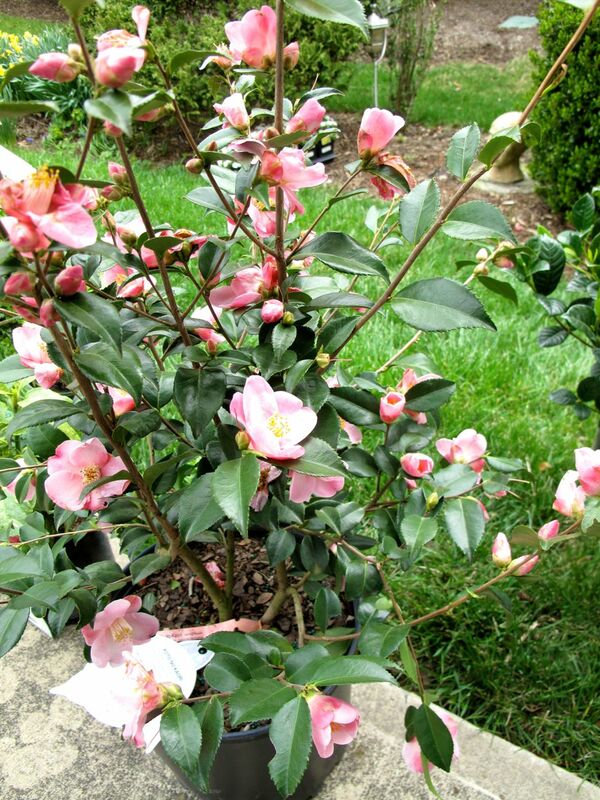 Oh, glad you like the camellia Stepheny and I hope it likes it’s new home here. Was going to plant it today but raining again. Good luck with your new purchases, I hope they all thrive. Your garden is looking very lively to me. 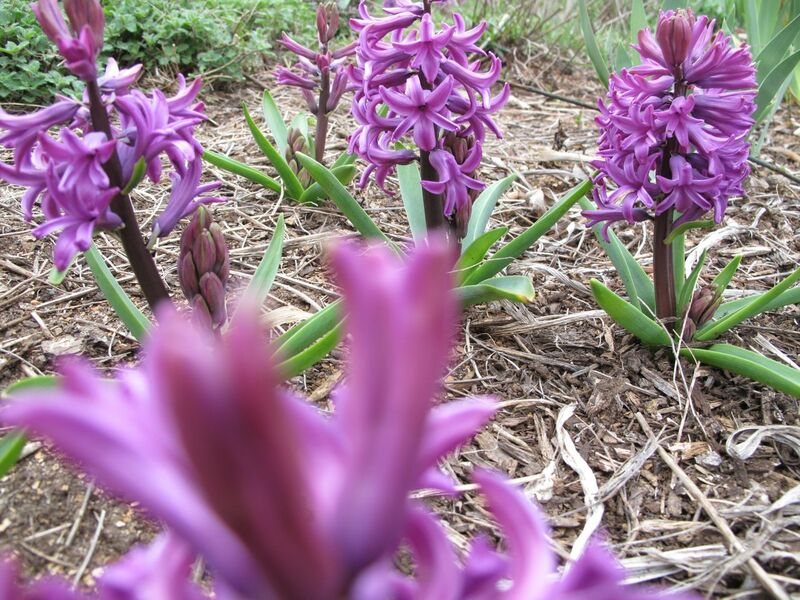 Do you enjoy the fragrance of your Hyacinths? Thanks Jason. The garden is off to a good start. I put hyacinths in my Monday vase this week and working with them up close for photos was pretty overwhelming. I do like the scent of these though–kind of spicy. Oh I adore your March garden so green and sprinkled with color….and what fun to be able to visit a garden centre already…it will be weeks before they open here. Thanks Donna–it is a treat to see the garden start to rise up. This garden center is open year round, but in early spring the outdoor area starts bulging with new plants and it’s a fun place to explore and get new ideas. Thanks. I was going to get started planting this morning (Monday), but its another rainy day. Still trying to decide where to put them. Your camellia is lovely! Have you been to Camellia Forest? The new camellia has a nice fragrance too. I did go to Camellia Forest once but I was so overwhelmed by the choice I couldn’t make a decision. I should get out there this spring.